Born in north-west Queensland, Shirley Macnamara spent most of her early childhood moving between remote cattle stations in Queensland and the Northern Territory. She holds close ties to both her mother’s traditional Indjalandji-Dhidhanu country, and her late father’s Alyawarr lands. Her time-consuming, considered and process-based practice draws upon issues of environment, history, politics, culture, family and deeply personal emotions to create poetic objects of immense beauty and poignancy. She uses natural materials to create objects such as guutu(vessels), baskets and large installations that reflect natural forms. 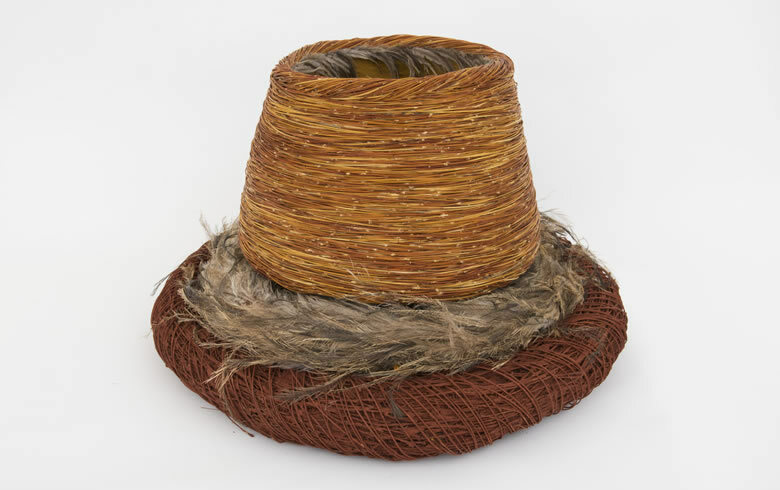 She works mostly with native Spinifex grass, which she weaves to create objects and sculptures that reflect her environment and their association with climate, earth, and life, past and present. Macnamara’s sculpture represents one of her traditional stories of the Indjalandji people that tells of the hot red ground and Spinifex ridges where the giant people lived and laid traps for the emus and hunters. As the giant people’s job was to trap emus, they would make drumming noises like that of an emu to attract or coax the emus and the hunters into their traps, leading to their demise. The yellow ochre is from the giant people’s babies.